A POWERFUL cross-party set of MPs will re-establish an influential pressure group designed to take important coastal issues to the heart of Government. Headed by North Norfolk MP Norman Lamb and featuring MPs with. coastal constituencies from around the UK, the group will act as a forum for debate – and attempt to sway Government policy. The All party parliamentary Group on Marine and Coastal Issues will hold an initial meeting on February 9 in Westminster, at which they will set out some of their objectives. 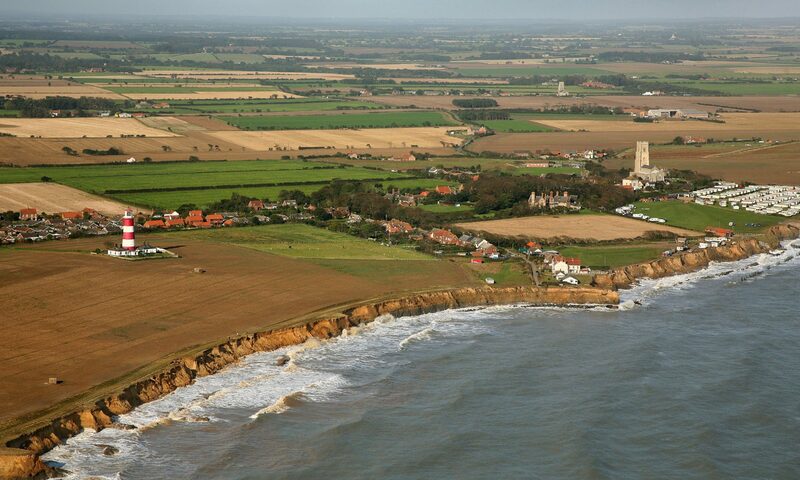 On that date they will also hear a presentation from Norfolk campaigner Malcolm Kerby, who has spearheaded the coastal erosion effort at Happisburgh for several years and taken his lobbying effort into the debating chambers of the UK and Europe in the process. Last night Mr Lamb said the intention was to provide a platform for discussion about all sorts of coastal and marine issues, but that erosion and sea defence looked set to play a major part in discussions. “It will bring maritime MPs together in one place at one time and provide a chance for us to work together across the major political parties. “Interested parties can look at the issues, formulate policy options and encourage wider political debate and action on the coast.” Mr Kerby said the creation of the all party group was evidence of the Norfolk experience with coastal problems reaching a wider audience. “There are some MPs out there in other parts of the country who have shown precious little interest along the way, but they have finally realised they and their constituents are going to be touched by these issues. The group has been set up in conjunction with CoastNET, an international networking organisation that works with a wide range of organisations to fmd long-term solutions to coastal problems. Back in Norfolk, Mr Lamb and Mr Kerby also intend to set up a local group open to the likes of parish councils, community groups, leisure organisations and individuals. The group would meet regularly and exchange information about the latest changes in coastal issues. Mr Lamb said the most important aim of the group was to “keep people in the loop”. YOUR report of (January 12): “Anger over cash freeze for sea walls”, usefully drew attention to the challenge we face in dealing with flood and coastal erosion risk, but may have left your readers with the impression that the Government is not concerned about the problem. Quite the opposite is the case. One measure of our commitment is the increased funding we have made available – up from £310 million in 1996/97 to £570 million this year, a 35 per cent increase in real terms – which has improved protection to coastal communities up and down the country. People whose property is at risk understandably want measures in place now. However, we have to prioritise proposals fairly and we do so using a published and objective system based on the benefits each proposed project is likely to provide which also reflects the urgency of the works. We need to ensure those at greatest risk get priority. I must emphasise that inland and coastal projects are considered on an equal basis and that it is entirely wrong to suggest there is any bias against coastal projects. On top of the many millions of Government funding that the Environment Agency will invest on our behalf in managing the risk of sea flooding, direct Defra funding for local authorities next year will increase to £74 million, the vast majority of which is for coastal erosion projects. This is £19 million more than planned. There is no “indefinite moratorium” or “freeze”. On the contrary, we have successfully committed record funding for capital works in 2006-2007 to a large programme of ongoing improvement projects. Because the budget is also substantially committed for 2007-2008 we will not be able to fund any more projects to start in 2006-2007. However, we do have uncommitted funding for 2007-2008 and I will be reviewing the position in the autumn to see what further projects we can fund from 2007-2008 onwards. We will take account then of the many beneficial projects around the country awaiting grant aid, including the one at Cromer. Let me begin by saying I do understand and appreciate the complexities and difficulties facing the Minister and his department in the matter of coast protection. Their task is indeed an onerous one, however it is not helped by the delivery of misleading information unintentional or otherwise. The second paragraph of his letter is grossly misleading. I do not doubt the figures he quotes from 1996-97 to this year are correct but they are the combined FLOOD and Coast Protection figures. If we look at the 05-06 budget of £570million,it seems really good until under closer scrutiny you discover that only £47million is the actual amount for coast defence in the entire UK. So in fact only £47million is available to be split between over 70 Maritime Authorities (like NNDC) and Internal Drainage Boards (IDB’s) the rest, £523million, goes to flood areas predominantly inland. To put that into perspective the recently completed coast protection scheme put in place at Scarborough which was scheduled to cost £28million but ended up costing some £53million (£25million over budget) used up £6million more than the entire UK coast protection budget! Indeed when you look at the REAL figures you see that whilst the overall FLOOD and coast protection budget allocation has risen over recent years the actual amount going to coast protection has reduced and apparently will continue to be reduced. The publication of the Government think tank report the Foresight Study in 2004 drew attention to the fact that successive administrations have consistently and massively underfunded coast protection over the last 25 years. In my view all of the foregoing is about as clear an indication as you can get that the system is disproportionately and unfairly slewed against coast protection in favour of inland flood protection. I am staggered that the Minister appears to be proud of this biased situation, he says ” direct DEFRA funding for local authorities” such as NNDC “next year” (06-07) “will increase to £74 million, the vast majority of which is for coastal erosion projects.” That figure is a fraction of what is desperately needed. There is an urgent need for those at huge and imminent risk to get a fair share of available funds. Currently the arbitrary benefit / cost criteria and point score system applied by DEFRA seems to ensure funding is moved away from the coast inland. With regard to future spending, everything I have seen from DEFRA seems to indicate there is a freeze on coast protection with no further funding or commitment for two years and no indication of what will happen three years hence. How on earth can the Maritime Authorities be expected to operate on that basis let alone plan ahead? Quite where that leaves the Cromer scheme is anybody’s guess.In my view we might as well kiss it goodbye,as with everything else along this coast as soon as we seem to be able to qualify for funding and get a scheme DEFRA move the goalposts and leave us offside! What I do think is deplorable is that NNDC were given the nod to prepare a scheme on the understanding that the time was now right, spend £140,000 getting to this point to be told only now funding will no longer be available. Hopefully the Minister will do the honourable thing and authorise full reimbursement.